(Photo by Madison Routon) Javon Franklin with a run for NL. Friday night’s game between North Lamar and Idabel had the opening that any coach could want in a football game. The ending, however, was not as desirable as the Panthers fell to the Warriors 43-27 on the road. North Lamar, under new head coach Aaron Emeyabbi, took the opening kickoff and marched down the field. The Panthers went 55 yards in six plays. The drive started on their own 45 yard line thanks to a nice kickoff return by Javon Franklin. It was senior quarterback Sam Cowling with a 13 yard run that would open the scoring for North Lamar. It didn’t take the Idabel Warriors long to answer the North Lamar score. On the first play from scrimmage, quarterback Tyriq French would give the North Lamar defense a taste of things to come. French found his star receiver, Tyrone Howell, for a 49 yard touchdown pass. The completion was the first of 18 for French with Howell being on the receiving end of 13 of them. It wasn’t just French’s arm, though, that gave the Panther defense fits. He also picked up 190 yards on the ground. Of the 478 yards Idabel had on offense, 418 of them were from French. After Idabel missed the extra point attempt, the score would remain 7-6 until the start of the second quarter. It was on the first play from scrimmage that French scampered for 11 yards and another Warrior touchdown. The two-point attempt was no good as French’s pass fell in complete. The score was now 12-7 in favor of the home team. This drive was setup by a turnover from the Panthers’ offense. Driving down the field, late in the first quarter, North Lamar was facing a second down and 11 from the 42 of Idabel. On a read option play, Cowling tucked the ball and ran. After getting through the defense and breaking some tackles, he headed for the goal line. As he got inside the 15 yard line, a Warrior defender was able to punch the ball out from behind causing a fumble. Idabel picked up the loose ball and ran it back to their own 27, setting up the scoring drive. The Panthers’ offense would not be denied, though. They answered the scoring drive from Idabel with a nine play, 63 yard drive of their own. This time it was Franklin who found the end zone. It was the first of three touchdowns on the night for Javon. Chayanne Peralta kicked the extra point, making the score 14-12 in favor of North Lamar. Idabel, however, would show how explosive their offense can be. The Warriors would score three times for 16 points in the final 4:02 of the first half. The scoring started with a four yard run from French. The extra point was good, making the score 19-14. North Lamar would finish with a three and out on their next possession, forcing a punt to Idabel. It only took the Warrior offense two plays to travel 47 yards. The big play was improvised by LaQuan Wells. Wells took the handoff from French near midfield. Trying to escape trouble, he was wrapped up. The play looked as though it would go for a loss of yards. However, before he went down, he flicked the ball back to French. French was able to easily get by the defense and take the ball to the end zone. A missed extra point made the score 25-14. Another three and out by the Panthers gave the ball back to Idabel with under a minute to play. 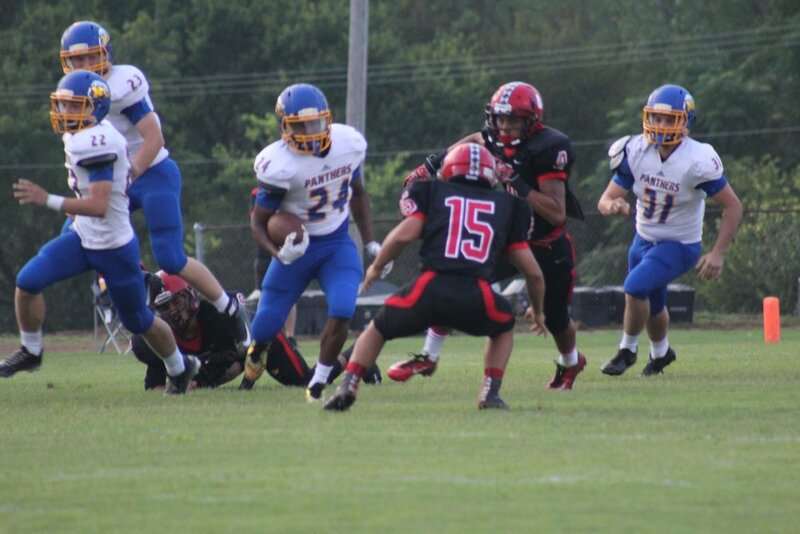 The Warriors took over in great field position, too, as they got it at the 39 of North Lamar. Three plays later, they had the ball on the eight yard line. Jarrett Bushers lined up for a 25 yard field goal and split the uprights. The Warriors led 28-14 at the break. The North Lamar defense opened up the second half with a bang. They held the high powered offense of Idabel to only seven yards on their opening possession. The punt for the Warriors only netted five yards, giving the Panthers the ball at the Idabel 35 yard line. Franklin took two handoffs from Cowling on the next drive and got 35 yards and a touchdown. The extra point made the score 28-21. The defense would once again come up big. This time it was on a fourth and goal play. French’s pass fell incomplete, turning the ball back over to North Lamar. Franklin would once again capitalize. This time, he took it 59 yards for the score. The extra point was no good, so the score was 28-27. That would be all the scoring North Lamar would get in the game. Idabel would score twice more in the fourth quarter. The first coming on a 77 yard drive. The second coming on a 72 yard drive. Franklin finished with 226 yards on the ground. Cowling had 100 for the Panthers. They had no passing yards for the game. North Lamar will be at home for the next two ball games, beginning next Friday night when they host Mt. Pleasant. It will be senior night. Kickoff is set for 7:30.